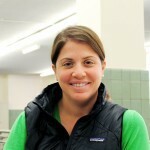 Trude is the Middle School Director of Academic Technology and the Class 6 Supervisor at The Chapin School in Manhattan. In addition to these roles, she is the coordinator of service learning and serves as a coach of the middle school robotics team. Previously, Trude has taught 5th grade Humanities, 6th grade English, 8th grade speech and debate and 12th grade psychology. She completed her year of national service with City Year Boston. She is currently the co-chair of City Year's National Alumni Association Board. Trude holds a BA in Psychology from Trinity College and an MA in Education Leadership from Teachers College, Columbia University.